Bed rails for elderly are excellent devices for helping elderly get into and out of bed, move around while in bed and prevent falls. They are also beneficial for maintaining a senior's independence. Are your parents afraid they won't be able to get out of bed on their own? Seniors can (and do!) get stuck in bed. Don't let it happen to your loved one. Any loss of independence can affect an aging parents' feeling of control. Providing the tools to help them be able to move around independently can also help them feel good about their ability to continue to care for themselves as they age. Of all the equipment I have recommended over the years, I have found bed rails for elderly to be one of the most popular. Often elderly are hesitant to even try using bed rails. Once they do, however, I find most seniors love them! I don't know how many times I have encouraged a senior to "just try one" - the next time I come back, they rave about them! 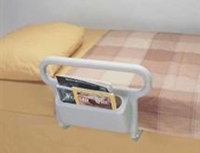 Bed rails for elderly are simple devices that attach to a senior's current (or future) bed. They provide a solid place to pull or push on while getting in and out as well as moving around in bed. 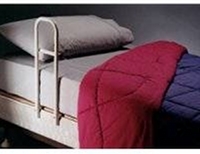 Bed rails for elderly make it easier and safer to get into and out of bed. Some seniors even find bed rails comforting if they move around a lot in their sleep and worry that they will fall out of bed. A bed rail is a great prop to help with rolling and moving around in bed, especially when strength and flexibility are issues. People with diseases such as COPD also find movement particularly tiring, so having a surface to hold onto when moving around is an energy-saver. Bed rails for elderly provide an extra hand hold and a way to be able to use your arms when moving from lying to sitting (or vice versa). This is especially helpful when abdominal (stomach muscle) strength is poor, which is typical in the older population, or pain is an issue. Having a surface to hold onto when moving between sitting and lying can allow a person to move in a particular way to avoid pain, rather than flopping back. Bed rails provide guidance for where to sit to get positioned into bed the best way. I will often see seniors that know exactly how they like to lay in bed. They find the easiest way to get into this position is to set up their bed rail so they sit right beside it and then use it to move into bed. I have also seen the elderly use bed rails for positioning to get up. They know if they hold the bed rail a certain way and move themselves up beside it, they will swing out of bed into the right position to stand, will be able to move in a way that is the least painful or avoid banging their sensitive feet. Bed rails for elderly provide a surface to hold onto when moving from sitting to standing. Elderly often have dizzy spells. I find that bed rails are really helpful for this - they allow the person to keep holding on when they stand up. They can assess whether or not they are feeling dizzy and unsafe to move while still holding onto a stable surface. I often encourage seniors to stand up with a hand on their bed rail and take three breaths before moving. This gives them time to see if they are dizzy before starting to walk. If they are very dizzy, they still have hold of the bed rail for stability or can sit back down, knowing they are in the right position. Probably the most important advantage is that bed rails for elderly will allow your loved one to continue being independent. No one wants to have to depend on others. A bed rail might mean the difference between needing help in the morning/evening and being able to do get up/go to bed at their leisure. It's a simple device but can help prevent falls and enable your parents to remain independent. This may seem like a dumb question but I've seen far too many bed rails for elderly in the wrong place. Bed rails are intended to go at the top half of the bed, beside the pillow area. The actual positioning along the bed can vary depending on the senior's preference or body size. Small seniors might prefer the bed rail to start about mid-way up the bed. Tall seniors might prefer the bed rail to be at the very top of the bed in order to give them more room to swing long legs into bed. Regardless, the positioning of the bed rail is meant so that the senior can use it to get the best possible position in bed with as few movements as possible. They should not have to reposition themselves a bunch of times after lying down in bed. Where to Start - Begin with the bed rail at about mid-way up the bed to three-quarters of the way up the bed. Then adjust as needed for your loved one to be the most comfortable and to have the best success getting into and out of bed safely - with the least possible need for repositioning after lying down. Not at the Foot of the Bed - I had one elderly gentleman who wanted to try the bed rail at the foot of his bed, as his legs would often fall out of bed at night. This didn't work, however, because he also had issues with strength and flexibility so he couldn't get his legs up and over the bed rail when getting into and out of bed. It would be a very rare occasion that it would be appropriate to put the bed rail at the foot of the bed. There are many different types of bed rails for elderly, both in size and quality. Even though I work with bed rails on a daily basis, I was surprised at the variety that can be found on the internet. I put some of my own personal recommendations below. 1) Type - Some bed rails for elderly attach to the side of the frame while others are designed to be held in place by the weight (and friction) of the mattress on the box spring. There are more details about types of bed rails in the section on securing and installing a bed rail. 2) Width - Bed rails for elderly can get in the way if they are too wide. Make sure the user can still get in and out of bed as easily as possible. Also make sure the portion that fits under the mattress does not stick out one side or the other. 3) Height - Some bed rails are height-adjustable. To check height, make sure your parent can hold onto it when they are standing up fully as it allows them a secure balance point when standing and makes the bed rail easier to use. Height adjustability might be a plus if your parent might move in the future or if the regular bed rail is not tall enough (ie. a mattress with a thick pillow top). Some of the disadvantages are they can be less sturdy and I have found that they have more parts that stick out and might catch sensitive skin. 4) Portable - Some designs are portable. This is good for people who spend time traveling or visiting different relatives as they can take it with them. One of the disadvantages is they can be a bit less sturdy, as with the height adjustable bed rails. 5) Weight limit - Make sure it is suitable for the intended user's weight. They are often designed for individuals less than 250lbs. Bed rails for elderly cost between $50 and $150, depending on the design. If the bed rail does not have to be transportable, I tend to recommend the Nyacc NYO1 Bed Assist rail. It is a sturdy, 1-piece bed rail that is easy to install. It comes with strapping which can or cannot be used as is appropriate for your loved one's situation. The weight capacity is 300 pounds and it has a soft foam handle that has generally been durable over the long-term. This brand bed rail may not work in a few situations. For one, if you have an extremely tall person that has to stoop to hold this bed rail when standing up at the side of the bed. Another is if the bed rail needs to be transportable. I do not have a particular recommendation for a bed rail that can be folded and made more compact for travelling. There are many options that are built for travelling. Some have metal release buttons so they can be taken apart and made more, others simply fold down and are said to fit in a suitcase. It is be important to make sure the user is able to use the features for take-down and set-up or their caregiver will be present to assist. Also, make sure to check the weight capacity, particularly on the lighter versions. The disadvantages of portable bed rails for elderly are they may be less sturdy and the components to take them apart might be difficult to work with. If you are able, try to see a portable bed rail and fold it down and up prior to purchase. 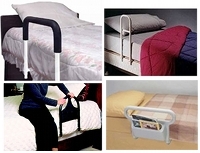 Since there are many options bed rails for elderly , there are also many options for securing them. This type works best with a box-spring and mattress or a heavy, single mattress in a box frame. This can be quite sturdy. 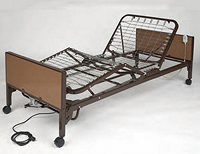 They can only be put on certain types of beds (with metal frames) and are not easily transportable. These bed rails depend on the weight of the mattress to hold them in place. Unsecured bed rails are generally used only with a box-spring and mattress or a heavy mattress (ie. pillowtop) on a box frame. If the mattress is heavy enough, the weight of the mattress usually works well to keep the bed rail secure. These do not usually work well with beds with an adjustable head or with hospital beds. Bed rails for elderly are installed differently, depending on the type of bed. The bed rail is installed between the mattress and the box-spring. The bed rail is installed between the mattress and the frame. The installation of the bed rail on a single mattress on a box frame is the same as the boxspring and mattress - with or without strapping - except the bed rail is placed in-between the frame and the mattress. 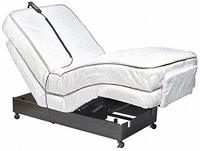 Usually adjustable head and foot beds are a box spring and a mattress that fold at the knee and buttocks section. This allows seniors to bring their knees and head up electronically, often providing them a more comfortable sleep or rest. The type of bed rail that works the best for these types of beds are usually the bed rails with strapping as the mattresses are not heavy enough to keep bed rails for elderly in place. The strapping also keeps the bed rail in place when the head of the bed moves. For hospital beds, built-in side rails are better than adding a bed rail, regardless of the type. Hospital beds often come with either rails that span half the bed (half-rail) or a rail that goes the full length of the bed. Half rails are usually used for the same purpose as the bed rails mentioned above: increased safety, mobility, positioning and to prevent falls when getting up and down. Full rails are usually used if a senior is frightened of falling out of bed. Full rails are almost impossible to put up and down independently so these would only be used if a senior has a caregiver to assist. I have had instances when we have put a bed rail on a hospital bed that did not have a built-in half-rail. I found, however, that the fit is poor and it is very difficult to put them on. The bed rail would have to be secured. The type with strapping do not work well, particularly as it is difficult to deal with the strapping with the variety of moving parts on the hospital bed. 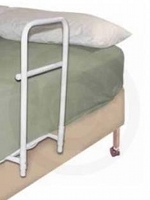 The types of bed rails for elderly that secure to the bed are also difficult to install on hospital beds.